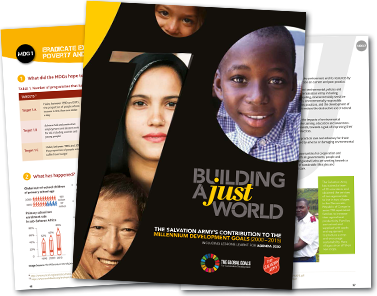 Building a Just World examines The Salvation Army's contribution to the Millennium Development Goals (MDGs) - the UN's sustainable development programme between 2000 and 2015. It also includes photographs, stories and an explanation of the Army's holistic approach to addressing each MDG. You can download or bookmark this publication here or read it below. Reference is made in Building a Just World to an online supplement, available here.